Proven technology designed for safety-critical applications in Marine, Nuclear, Oil & Gas and other industries. SafeOperator (also known as Uniflex-Stow) is the most comprehensive solution for the remote operation of valves, in every industry, available today. We lead the world in delivering systems which make your industry a safer place. 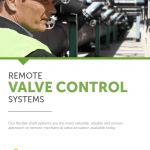 Remote mechanical systems for the operation of valves allow every industry to locate the point of operation in a place of safety or convenience. SafeOperator allows you to improve safety with greater versatility. Operate valves in any location, even underwater. The simple alternative to a powered (electric, hydraulic, pneumatic) actuators. Safety and versatility with our complete and proven SafeOperator range. 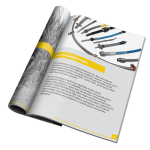 Download the Remote Valve Control Systems brochure now for information on our flexible shaft systems for mechanical valve actuation. This system uses relatively small diameter flexible shaft to make system installation and routing extremely FLEXIBLE. Our high quality remote operators can be fitted with a range of handwheel sizes to suit the required input torque. They are easily mounted to any rigid structure. The flexible shaft assembly is extremely hardwearing and can be installed in most environments. It has easy connections to remote operator and the valve gearbox. The valve gearbox features a unique epicycloidal design which has advantages superior to other gearboxes using common involuted tooth gears. Components operate in compression, not in shear. Unlike gear teeth with limited contact points, it has two-thirds of its reduction components in contact at all times. This design enables the gearbox to withstand shock loads exceeding 500% of their ratings, and provide exceptional performance, reliability and long life in the most severe applications. A variety of valve connection options make SafeOperator IG a great fit for any valve. Use our Product calculator to determine which system is right for your valve. Find out more about our SafeOperator Flex Shaft with Integrated Gearing Solution. We're here to help. Send us an inquiry today! Find out more about our SafeOperator Flex Shaft Range System. This system is generally great for lower torque requirements. It feature a panel mount options which makes it possible, with an handwheel adapter, to install a lower cost solution. A range of remote operators are available and connection to the valve can be made using a valve coupling or a direct connection to the valve or valve gearbox input shaft. The valve coupling is simply bolted to the existing valve handwheel making installation very simle and engineering free. It is sometimes the case that our SafeOperator FS system is not suitable for very large valves with high input torque. In this case we offer alternate gearbox options. Use our Product calculator to determine which system is right for your valve. Rigid rod systems are ideal where remote valve operating system paths are straight or nearly straight. The rigid rod can accommodate sharp bends easily with the use of gear boxes or swivel gear joints. In addition to the rigid components, Elliott manufactures numerous adaptors and other fittings so that combination flexible shaft and rigid rod systems can be used together to handle particularly difficult design problems. The quality of our rigid rod systems is equal to that of the flexible shaft components and conform to Naval Sea Systems Command Specifications. Find out more about our SafeOperator Rigid Rod Range System. onshore oil & gas facilities and the off-shore rigs, FPSO’s and platforms a great alternative to other crude mechanical systems and expensive electric actuators. Use as primary or back-up; under-water or in other hazardous environment; keep out confined spaces and operate at ground level. Good for virtually any type of valve. SafeOperator is the leading flexible shaft (reach rod) solution for the shipbuilding industry. It is the only ABS full type approved product available and will deliver totally reliable performance on board ship. Our ballast valve system allows central manual back-up and meets the requirements of ABS & DNV for ballast tank control. SafeOperator is a simple, reliable, robust, easy-to-install system which offers the water industry a great alternative to other crude mechanical systems and expensive electric actuators. For example, if a valve does not require frequent operation but is in a hazardous or inconvenient position then SafeOperator solves the problem. SafeOperator is a simple, reliable, robust, easy-to-install system which offers the chemicals industry a great alternative to other crude mechanical systems and expensive electric actuators. For example, if a valve does not require frequent operation but is in a hazardous or inconvenient position then SafeOperator solves the problem. Our system components are designed specifically for the power generation industry. The variety of sizes and types available in both flexible shaft (we invented flexible shafting) and rigid rod configurations will solve any conceivable remote valve operation problem. The speed and ease of installation will reduce installation costs. Our products are 10CFR 50 Appendix B compliant and recognized as the industry standard for quality, yet our pricing is highly competitive. How Long Has Elliott Been Manufacturing Remote Mechanical Valve Operation (RMVO) Products? Elliott Manufacturing has manufactured valve operating solutions for almost 60 years. Our SafeOperator product line is widely recognized as a benchmark solution for remote mechanical valve operation. Throughout our history, we have built all our RMVO products with user safety and reliability as our top priorities. What kind of RMVO systems does Elliott Offer? Standard Flexible Shaft System (FS) – Handles valve torque up to 80 foot.-lbs. (109 Nm), up to a distance of 125 feet (38m), with a minimum bend radius 12 inches (47cm). Integrated Gear System (IG) – Handles valve torque up to 250 foot.-lbs. (340 Nm), up to a distance of 89 feet (27m), with a minimum bend radius 8 inches (20cm). Contact one of our Application Engineers to find out. The SafeOperator product line can be used with or without a gearbox, connect directly to a valve or valve gearbox input shaft, even to a valve handwheel eliminating any valve topwork engineering. With SafeOperator, you have many, many options to suit your project. As much information about the type of valve (size, rating, etc.) you can supply is a good start. Other items of note: maximum input torque to operate valve or gearbox, distance from valve to point-of-operation, number of 90° bends and your preferred handwheel position (vertical/horizontal). Or contact us and we’ll do the legwork.